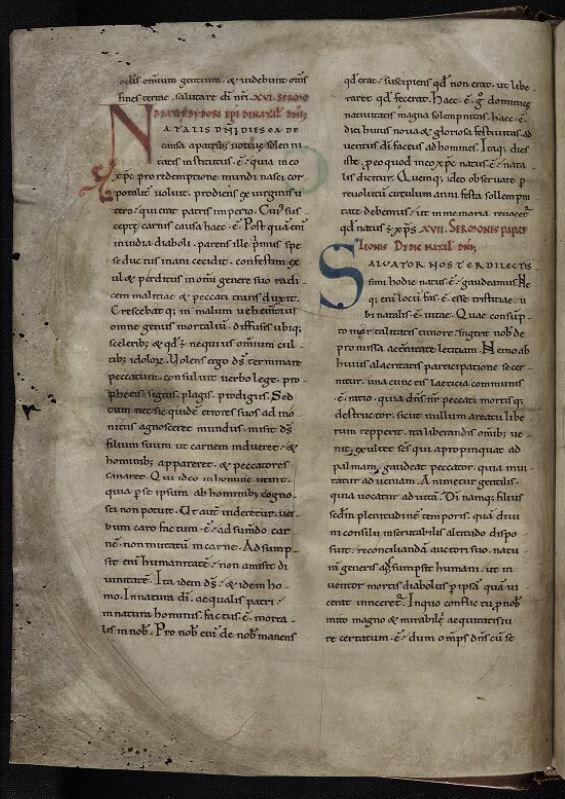 Durham Cathedral Library B.II.2 is a homiliary — a book that has gathered together a selection of patristic (that is, ancient/late antique Christian) homilies. This particular selection of homilies is a collection put together by Paul the Deacon (720-799), who is more famous for his historical writings, The History of the Lombards and Historia Romana. Like our friends at Durham Priory, Paul was a Benedictine. A homiliary was used to provide guidance or even the actual form and content of preaching. All of Paul’s works were edited in 1861 in the massive Patrologia Latina series, vol. 95, alongside the Venerable Bede. Natalis domini dies ea de causa a patribus uotiuae solennitatis institutus est quia in eo cristus pro redemptione mundi nasci corporaliter uoluit. The birth-day of the Lord was instituted for the cause of a solemnity that was vowed by the fathers because on it Christ wished to be born corporally for the redemption of the world. The passage from Isidore runs to a bit of the way along the second column of 2v, followed by Pope St Leo the Great whose homily runs to folio 3v, where another Leonine homily starts. After Leo, we have Christmas homilies from Fulgentius of Ruspe (1 homily) and Maximus of Turin (4 homilies). On 9r, the Feast of St Stephen (Boxing Day) has a homily from St Augustine of Hippo, and the homilies continue in order of the feasts of church year until Holy Saturday. The selection is not precisely what the edition of Paul the Deacon has, making many omissions, but also adding the Fulgentius homily. The patristic foundations of medieval spirituality are quite clearly demonstrated in this manuscript; the authors included are Ambrose of Milan, Augustine of Hippo, the Venerable Bede (often considered a Father of the Church in the Middle Ages), John Chrysostom, Fulgentius, Gregory the Great, Jerome, Isidore of Seville, Leo the Great (more than anyone else, in fact), Maximus of Turin, Origen, and Severian. Back to the subject of Christmas. As a scholar of Leo the Great, I am glad to see that he is represented twice in the Christmas homilies. This makes sense, since Leo’s great contribution to the history of theology was the establishment of two-nature Christology as the dogma of the imperial (later Roman Catholic and Eastern Orthodox) church. This theology comes out most frequently in his Christmas sermons, where he demonstrates his skills as an orator. Dearly beloved, our Saviour was born today — let us rejoice! For there is no acceptable place for sadness where it is the birthday of life. Life which, with the fear of mortality consumed, brings us happiness from the promised eternity. No one is separated from participation in this cheerfulness; one happiness, common to all, is the reason — because our Lord, the destroyer of sin and death, just as he rediscovers no freedom in sin, so also he comes for everyone to be freed. Let the holy man rejoice because he approaches the palm; let the sinner be glad because he is invited to indulgence; let the gentile be animated because he is called to life. For the Son of God, according to the fullness of time which the height of inscrutable divine counsel arranged, has taken up the nature of the human race to be reconciled to its creator so that the inventor of death, the Devil, may be conquered through that which he conquered. This is the Christmas hope that warmed the hearts of Durham’s monks in the long nights and cold days of medieval winter. May you and yours have a festive and joyous Christmas season as well!